Resolved Should You Model RPA Using Standard BPMN Notation? From Max Young: Should you model RPA using standard BPMN notation? Or does RPA deserve it's own notation? Gartner says . . . .
"Robotic process automation (RPA) enables organizations to effectively automate tasks, streamline processes, increase employee productivity, and ultimately deliver satisfying customer experiences." Notice, no mention of how! Then they go on to say " By 2019, RPA will have limited impact on top-line growth for 50% of organizations that will erroneously focus on labor reduction, not on improving business outcomes". If we accept Gartner's definition of RPA, then one interpretation of "By 2019. . ' could be that organizations don't understand what RPA is or what it can do for them (i.e. putting a singular focus on labor reduction seems to be only one part of the Gartner definition). There is a download. I plan to read it. Thanks Karl: do you think that providing that 'how" will become more important, now that RPA is a pragmatic reality? Do you think that existing BPMN will serve? RE "Notice, no mention of how!" - this is a very good industry analysis. @Max Asking/seeing "How" is always important- i's the only way I know of to separate "bafflegab" from something that potentially has practical value. OK, see "RPA: Eight Guidelines for Effective Results" at the Gartner web site. Looks like the "happy path" implementation (page 3) is the "quick return" approach. Reason: this approach disallows RPA from trying to compete with BPM, which is a good thing ,because RPA is a poor substitute for BPM orchestration. I would not use RPA for messaging (on-demand or scheduled-event based because a generic data exchanger can do a better job on outreach/inreach )..
One bad piece of advice in the Garner white paper is "BPA tools work best when they have direct access to the data..."
NO! any interventions that do an end-run to bypass security are very naughty. Anyone who proposes this needs to go to their room. I have been asking my developers to build a "... watch me while I . . ." macro-recorder with enough smarts to pop up and say "I see you are walking through a list of payors adding 'trading partner contract expiry dates', copying partner IDs, doing a locate at the app UI, then copy/pasting the expiry date. Would you like me to run through the balance of your list?" Think of how many saved hours of tedious work could be saved by such a facility. Some will call this a "screen scraper"
The macro effectively is "throw away" as evidenced by no trace it was ever invoked as part of user processing, aside from the finding that working thru the list may have taken minutes instead of hours. I think it's going to be important to give customers the ability to describe their problems, and their solutions, in some sort of visual notation. BPMN isn't really a *tactical* notation: it more strategic. It doesn't really explain the step-by-step of *how* work is performed by a single role. It shows the interplay between those roles. I'd be interested in a notation that can demonstrate *how* a specific step in a workflow is automated. For example, a user gets an email, looks up the customer based on account number, generates a PDF report, and takes the customer's credit score, annual income, and dept ratio to the ACME Greenscreen system. I want to see this story in pictures. The thing is you really don't need much of any "notation" - anyone who can deposit circles on an electronic canvas and link these with directional arrows is well along the road to mapping processes. Branching decision boxes, loopbacks and link-to-pathway are additional needed constructs. Each step (i.e. circle) needs at least one form as an attribute, otherwise you have no easy way to collect context/situation appropriate data at step. Each step needs a routing tag so that run-time-side your workflow engine knows which user inTrays tasks need to be posted to. Any task that lacks a routing becomes a task for user "system" and the task has to be able to auto-execute. Forms may need rules, automated branching decision boxes need rules, steps may need pre-processing and post-processing rules. As for "users" - these folks typically only need to go to their InTray and "execute" any tasks that post. Background BPM will handle all of the orchestration, Case-level rules will take care of needed governance. Actually RPA can automate some human activities which BPMN labelling as "manual", i.e. external & unknown to BPMN. Obviously, BPMN and RPA are targeting the same business process but different "areas" of it. Thus, one notation to coordinate all activities around business needs will be very welcome. BPMN is used several different distinct ways for different purposes. Generally BPMN is used to represent TASKS that are peformed by different PEOPLE. We often use swimlanes to represent the role or organizational unit where the task is being performed. In this way BPMN is a representation of collaboration between people. RPA on the other hand is one piece of software, and every "TASK" is being done by the software, so this is nothing to do with collaboration. So it would seem to be a completely different domain except for the word "process" is involved in both names. All that being said, some "BPM" software is really nothing more than EAI (enterprise application integration) such as those systems based on BPEL. In those cases again, you "model" a process which is entirely performed by a server. People have tried to use BPMN for that, and there was a lot of consternation in teh standards group on how to convert BPMN to BPEL a few years back, eventually giving up, and deciding that BPMN was a distinct category from straight-thru style BPEL engines. That did not stop vendors from claiming that BPEL was the best way to execute BPMN. Finally, BPMN is actually failing. Vendors are producing their own extensions, and interchangeability only works in a very narrow subset of capabilities that most vendors offer. So it might be time for a new notation for collaboration anyway. In conclusion, RPA probably needs its own notation distinct from BPMN. "Finally, BPMN is actually failing." As we all know, BPMN is a vendor-driven notation. So, a customer-driven notation is need. I suppose our Case Management Platform has a "BPEL" in it. The customers don' t need to use it, see it, or even be aware of it - they are quite happy to have tasks post to their InTrays, where they micro-schedule these, then execute them - background BPM does the orchestration, steps along BPM pathways have rules that provide governance. Life for these folks is easy. The black box is a service, it takes inputs, carries out processing and generates outputs. ref: Peggy Lee (1969) - Is that all there is? RPA needs to be modeled? The marketeers told me I can just perform the to be robotized task(s) and the platform will 'record' it. As far as I remember your bread is long enough to ignore marketecture. Question of relation between methodology and its subject area is quite generic. One one pole, every case is specific and deserves its own methodology. On another pole, nearly every case can be cast to any given methodology with more or less voluntary approximations. If we use too many narrow methodologies, we complicate communication and mutual understanding between different stakeholders. If we use just one methodology, we may complicate transparency of models due to improper casts of real business objects to limited dictionary of the chosen modeling style. As always, reasonable balance should be observed between two these polar situations. In case of RPA, it doesn't have usually too complicated workflows and falls relatively well into BPMN domain, which exactly targets this class of business automation solutions and interaction of business and IT systems. In fact, role of RPA in terms of BPMN boils down to just one simple symbol substitution. 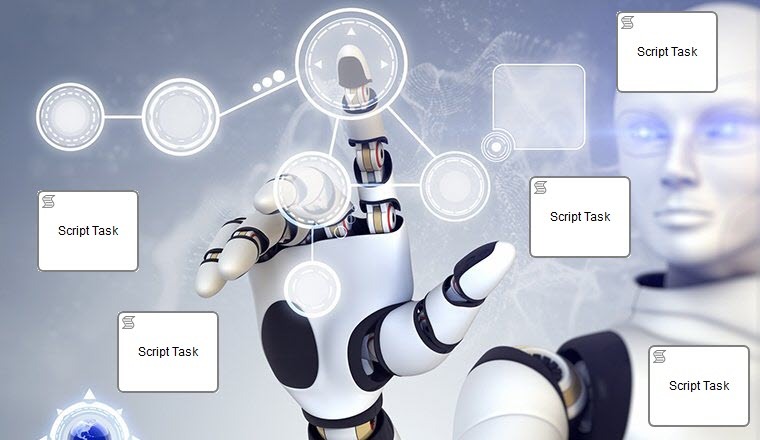 RPA replaces manual BPMN tasks with script tasks representing RPA automation scripts. And BPM replaces everything around "PRA automation scripts". Yes exactly. This is why RPA plays only a temporal role. @Alexander . . . "RPA replaces manual BPMN tasks with script tasks representing RPA automation scripts." is a good summary statement. Reading it, I don't see any obligation to "model RPA using . . . BPMN". One way to build the scripts is using the macro-record ".. watch me while I . . ."
Another approach we are hoping to use in healthcare is to auto-generate scripts for parsing new incoming EDI message formats using a 'sniffer" that reads a new incoming format, compares the format to that of a standard script, writes code that extracts the data elements. The idea is to save the programmer from having to write code - we have been playing with this for some time, it's still at the point where it is easier to just write the new code than have to debug the auto-generated code. Hmm...another TLA to create confusion giving Gartner another "task" without explaining "how"...nothing new there? Let's look at the words first Robotic that implies a physical presence then Process suggesting undertaking a number of tasks and then Automation just confirming undertaking a number of tasks automatically. Of course there is a need to build and program and that is in its self a process and should be transparent ans accountable. Adopting BPM discipline would be relevant and helpful to avoid costly mistakes. However such a robot uses data and delivers an outcome to be used and as such becomes just part of the larger end to end business process. Really simple and logical and why would you need BPMN unless of course you want to complicate everything ..... ? RPA is a "machine" and should not confuse the automation of business process where repetitive task can be handled and bringing in intelligence where the process can deliver decisions based upon past actions all of which can improve both user experience and productivity. Frankly I cannot see this RPA TLA helps business....! Maybe the question of RPA and BPMN might be broadening out. Deloitte seems to be redefining RPA as "little bits of process" . . . Original tweet was from @MBellias "Great overview of how technology is changing warehousing and maintenance processes, powered by IoT and AI", referring in turn to an article in Internet Of Business and entitled Five Predictions On The Future Of Smart Warehousing (by Chris Middleton.) I note that the innovation described here is very domain specific. Interesting that this discussion has broadened from simply talking about BPMN to draw what you might implement with RPA, to the relationship between BPM and RPA. Of course this also requires that we first think about whether we mean BPM as a discipline, in which case RPA just becomes one of teh many automation techniques that we might wish to deploy - either on their own or in concert to deliver the required business outcomes. Staying with the broader theme of using RPA as part of an overall BPM program, we should also ensure that we are not just appearing over the cracks with RPA, this is discussed in my second blog on the subject "Potholes on the Road" (see link below). One thing is for sure RPA is replacing BPMS built applications in many enterprises. High Code, Low Code, No Code, whatever the fashion is still no match for the quick, simply (and dirty?) fixes than many people are using RPA for. Our bigger worry should not be how people draw their process BPMN or otherwise, but that people are tempted to rip out people, replace using RPA without doing better end to end analysis. As we all know the implement first analyse second approach rarely works in the long term - hard to ask questions when the knowledge is gone. So returning to the question. Yes it makes sense to model your processes and you can use BPMN, some of those activities may then be implemented in RPA, as others might be automated in an ERP or BPM system. It does not make sense to start creating new notations or languages , we will only cause confusion, greater resistance to anlaysis and potential resistance. Sorry but use of term "Robotic" is just not appropriate for automation and intelligence in business software. Definitions make clear it relates to physical objects....no wonder business people despair of the confusing term invented by the tech world! I am confused (unless I am not reading your comment properly). Both Gartner and Wikipedia seem to be giving RPA a wider scope. Robotic process automation (or RPA or RPAAI) is an emerging form of clerical process automation technology based on the notion of software robots or artificial intelligence (AI) workers. RPA tools have strong technical similarities to graphical user interface testing tools. These tools also automate interactions with the GUI, and often do so by repeating a set of demonstration actions performed by a user. RPA tools differ from such systems including features that allow data to be handled in and between multiple applications, for instance, receiving email containing an invoice, extracting the data, and then typing that into a bookkeeping system. The data manipulation aspect is not something one would normally find in a testing tool. My list of connections now includes "people, software, machines and robots", but I figured RPA would take "people + software" and replace that with "RPA and software" particularly for little initiatives of the type ".... watch me while I . . ."
I suppose "machines and robots" could be bundled permanently, but it seems worthwhile to separate them because machines typically do what you expect them to do whereas who knows what a robot vacuum cleaner would do when it comes up to a spot on the floor that has a puddle of honey on it.? Then, we had the accident of a self-driving auto that saw a reflection of mountains on the side of a transport truck and plowed into it. Scary . . . .
See "Work, Workflow, Workload and BPM"
RPA has specific triggers and actions which are better served by using underlying hooks of their respective environments. It would take significant customization to the BPMN standard to create readily useable RPA artifacts. Which would defeat the purpose of BPMN as a standard. My point was that BPMN is too generic to be useful for RPA. Also another important point I'd make is - I believe that an RPA standard may never emerge, since a lot of notations are most relevant and useful within specific environments (operating system, remote technology, interface hooks etc).